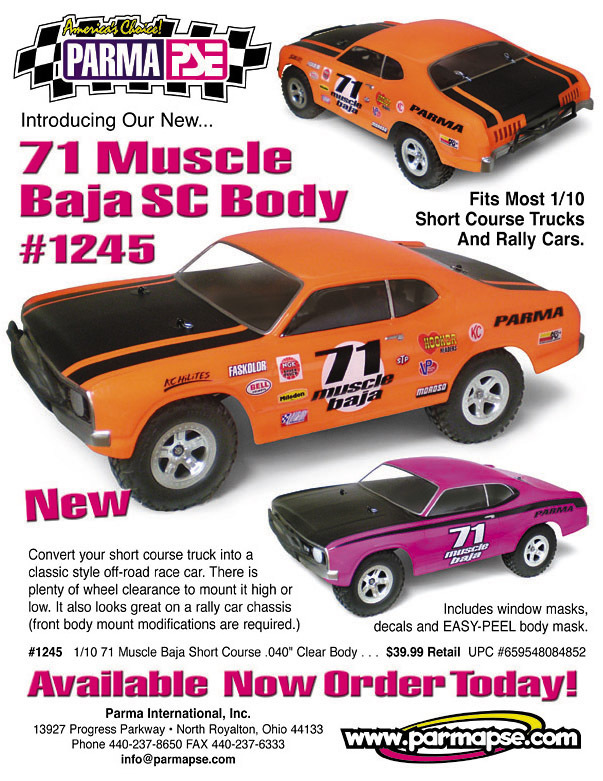 Parma have released another fantastic body for short course trucks, this time a 71 Muscle Baja SC Body, does anybody know of a distributor or shop in Australia that sell Parma bodies? My brother would kill for one, but freight from the US almost doubles the price of the body. MCD Racing have previewed their new XS-5. Based on the 5-series chassis the new XS-5 is a super sports car that carries the proven MCD on-road driving heritage. Based on the successful RR5 off-road car the kit is meant to kick off a new MCD product line. It’s great to hear directly from the organisers of events that are coming up rather than just picking information form RC Tech threads when I have the time. It was fantastic to hear from James Henderson about their Wide Bay Weekender event. Currently they have over 45 entries with 2 weeks to go until the event. Those entries already include Australia’s No.2 Nitro Buggy racer Aaron Stringer. The event promises some exciting racing and a great opportunity for more exposure of the sport. Wide Bay RC has been quiet over the last few years after hosting the AARCMCC IC Nationals back in 2008. With a new leadership in the last 2 years they have been bringing this club back to it’s former glory and ready to take RC to the next level. The event kicks off at Lunchtime on the 6th of September with racing going into the evening. Camping is available at the track for those travelling from out of town with the showgrounds facilities include camping facilities, toilets, showers and readily available power. What was the biggest surprise of the ROAR Electric Off-Road Nationals? While we are talking about the ROAR Nationals, one interesting piece that I saw from Ty Tessmann was that he borrowed some parts from a local racer Trey Roberts to make his (Ty) Losi 22sct 2.0. It’s very strange to see a HPI/HB driver driving a Losi, but race oriented Blitz ESE appears to be out of production, and a generation of design behind the competition, you have to drive something! It will be interesting to see if it is being driven as a precursor to a new HPI Short Course Truck in the way that the 2wd buggy Ty has been racing for some time is reportedly now a D215 buggy prototype. 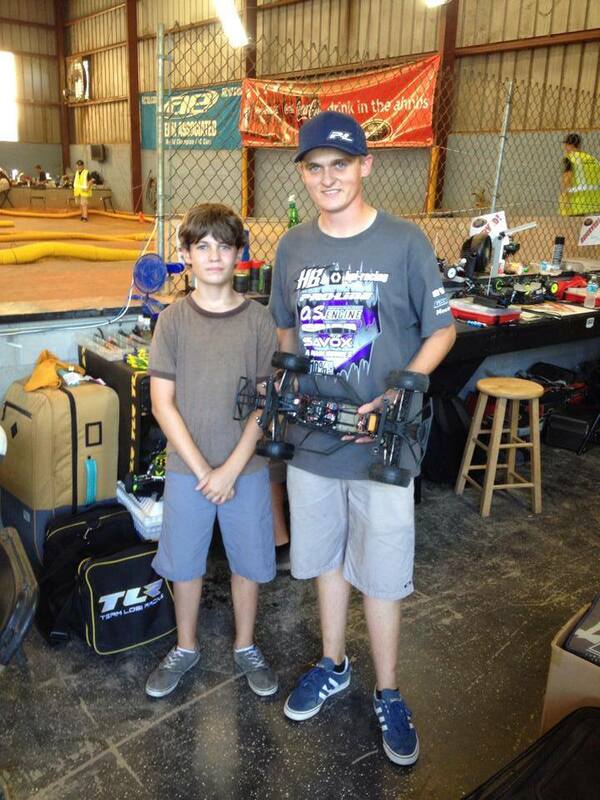 Anyway, photos and descriptions below from Ty’s facebook page, and Trey was given a Ty Body for his help as well, great to see that kind of camaraderie in the pits even at a major race. Thanks to Trey Roberts for the rest of the parts I needed to convert to mid motor for my 22sct 2.0. Thanks again for the parts Trey Roberts and enjoy the body. YEEEAAAHHH!! I won my first A-Main race at GCRC Raceway tonight! 2nd overall with a 3rd 2nd and a 1st. Thanks for the racing tonight boys! I would say that Casey Stoner was a little excited about his win at the Gold Coast RC Raceway yesterday! I must admit this tyre caught my attention, and not because it was new or yet another buggy tyre. Pro-Line is putting the competition on the Run with the all-new Fugitive race tire! The Fugitive was developed to be the longest lasting race tire ever produced while still being quick and agile. In the past, the prevailing knowledge for creating a new tire that lasted throughout the long A-Mains in extreme wear conditions was to design a big and tall tire tread that was spaced out. While this was effective for the day, the tall and stiff tread numbed out the handling and didn’t have the speed of the smaller pin race tires. Pro-Line’s all-new Fugitive tires set the standard for wear and performance with a whole new design philosophy – small, tightly packed pins that can handle the abuse of being run on concrete. When combined with Pro-Line’s incredible X-Compounds, the Fugitive easily has the best performance to cost ratio of any Pro-Line tire making it perfect for many European style tracks. Be the first one outrunning the competition with the Fugitive! The meeting started off with a fresh track that had never been run on by any of the competitors. The first lot of the 10 minute qualifiers for both classes didn’t go to successful. 2wd was my first class to hit the track, i had a bit of bad luck in the opening laps coming under the 2nd cross over and collecting a pipe and ended up pulling out a a ball stud. I was lucky enough to get back on the track for the last 5 minutes after making a few changes to the car. My first 4wd heat was good, i was lucky enough not to get caught up in the traffic and had a clean run with only one mistake handing me the TQ in first round by 10 seconds. During the second round of qualifying i had a bit more luck completing a solid run with only a few small bobbles giving me the TQ for the second round. My second run of 4wd was not very clean. Getting caught up some of the jumps and apexes. I was also struggling with the traffic which ended up leaving me in 3rd place over all with Mitch Steer in 1st and Chris Paterson in second. For the third round i made some changes two both car. 2wd i added a bit of weight to settle the car down and with the 4wd i changed tyres because the car was very loose in the 2nd qualifier. I went into the 3rd round of 2wd with Mitch having TQ in one of the earlier heats in the round. I had a very successful run keeping it clean while pushing out the same lap, lap after lap. 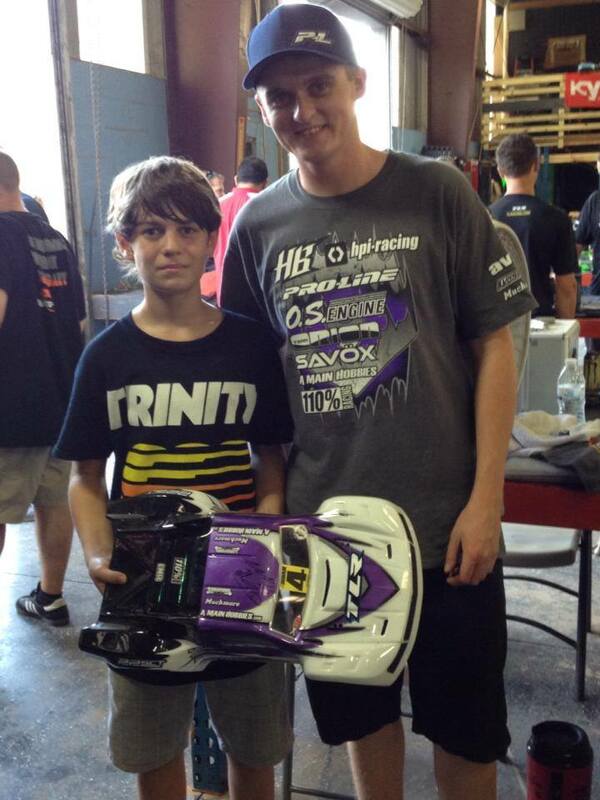 Which handed me the overall TQ in 2wd and the bonus $50. My last 4wd run was clean but i got caught up a a marshals foot half way through the race which unsettled me and ended up rolling me over. With that mistake i ended up missing the TQ in 4wd but came in second behind Mitch. During the first 2wd i started off from pole holding Mitch out for the first couple of laps then i started to pull away. After gaining over a 15 second lead at the 7th minute mark i just started to pace myself and holding my lead. Had a clean end to the race and ended up taking A1 in 2wd. For the 4wd main i started off second,getting squeezed into third by Chris into the first corner i was sitting in third but the he made a mistake going into the first cross over handing me back second. I then managed to find a gap on the inside of Mitch coming through the stutters which handed me 1st. Having a close battle for the next few laps until Mitch mad a mistake giving me a comfortable lead. I was able to hold that lead uncontested for the remainder of the 10 minute main. The second main for 2wd was not so easy in the beginning. I made a mistake coming over the first cross over rolling me over needing the aid of a marshal then nosing in on a pipe through the stutters putting me back to 5th. After mistakes from the leaders i was able to get back to 1st then pull out a gap then go onto win A2 handing me the win for 2wd. 4wd because of the resort i started on pole for A2 leading the pack away and being uncontested for the entire main handing me the A2 win and also giving me the over all for 4wd.